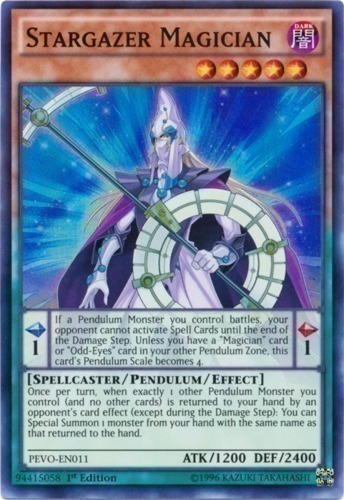 Text Pendulum Effect: If a Pendulum Monster you control battles, your opponent cannot activate Spell Cards until the end of the Damage Step. Unless you have a "Magician" card or "Odd-Eyes" card in your other Pendulum Zone, this card's Pendulum Scale becomes 4. Monster Effect: Once per turn, when exactly 1 other Pendulum Monster you control (and no other cards) is returned to your hand by an opponent's card effect (except during the Damage Step): You can Special Summon 1 monster from your hand with the same name as that returned to the hand.